When I think about the Congo, the first memory that comes to mind is learning to ride a bicycle. It was commonplace for the Missionaries to hire natives to stand watch and guard the mission homes. This gave the Congolese pay that they could count on, a sense of pride in their responsibility, and an opportunity to observe Christians up close. The Congolese are very generous people: an example of that generosity was a young man named Yambu. 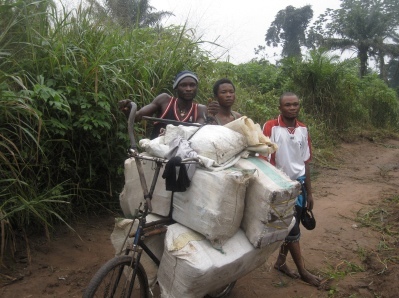 In Congo bicycles are considered valuable assets. they not only provide transportation, but they are a lifeline–a means of getting food to the market for sale or trade. Yambu was sharing his most prized possession. This was a precious recognition of friendship. My name became Kanyinda. Loosely translated it means I am a friend.